Thanks to new methods of producing food, biologists warn of a future day when mankind will become a toothless being with atrophied taste buds. Future humans may be fed nutrients completely via a diet of pills, tablets, and purées. With such a diet, teeth may become obsolete and taste buds may become unnecessary. Until this day arrives, it is worth traveling to Ecuador to try a delicious “locro” soup, tasty “fritada con mote” or “tamales de gallina”. 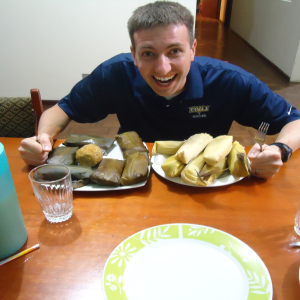 The traditional cooking In Ecuador is extraordinarily rich and varied. 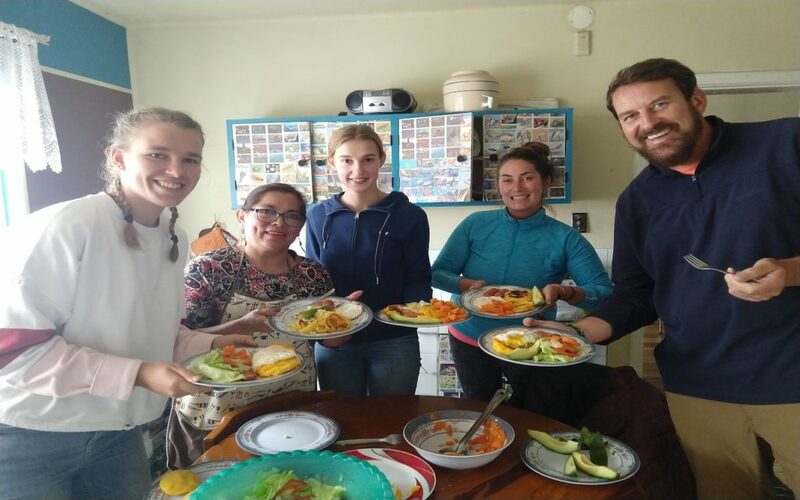 Typically broken up into the three different zones of Ecuador (the jungle, the Andes, and the coast), the diversity of inhabitants have developed a wide variety of food from a small amount of traditional elements. 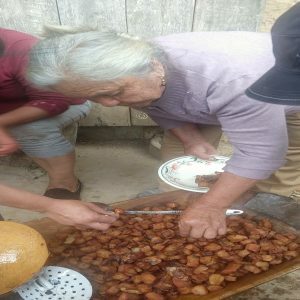 It is the fruit of thousands of years of experimentation and ongoing development, as recipes from indigenous tribes have incorporated ingredients from the Europe and the modern world. Below, Vida Verde is pleased to present a collection of traditional Ecuadorian dishes that you must try during your stay here. Ecuador is a country that is extremely proud of its heritage, and after experiencing (and tasting) the culture, we believe you will understand why! Soups are without a doubt Ecuador’s specialty. All lunches and many dinners are accompanied by a savory soup as the first course. Locro is considered the King of Ecuadorian soups. The word locro is derived from the Kichwa word ruqru, which means stew. 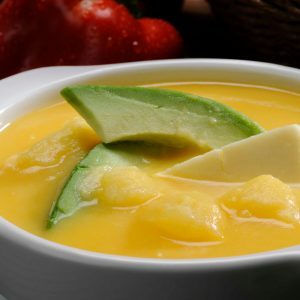 It is a creamy, potato based soup that contains cheese, avocado and is cooked with various spices. This dish is typically enjoyed in the Andes region of Ecuador. For those of you who want a more traditional and hearty version, try the Yahuarlocro, which has dried blood mixed in. Caldo de bolas is a typical soup from the Coastal region in Ecuador. It is a beef broth soup complete with green plantain dumplings, corn, yucca, and various types of meat and vegetables. It is usually served with lime and Aji (a traditional hot sauce that is served in every restaurant). The name Encebollado comes from the Spanish word for onion- cebolla. It originated in the coastal region of Ecuador and is considered the flagship soup of Ecuadorian gastronomy. In simple terms, it is made from a fish broth that contains tuna, yucca, onion, y cilantro. However, a good encebollado is spiced up as per the taste of the chef and is always served with a bowl of popcorn and chifles (banana chips). Many restaurants also allow you to add all the onions that you want! Fritada is a very simple, but mouthwateringly delicious dish. The main part of the meal is nothing more than fried pork cooked over an open flame. However, a good fritada incorporates the taste of the open flame and caramelizes the meat to create a melt in your mouth, campsite flavor. Traditionally, Fritada is served with mote (cooked corn), boiled potatoes, and Llapingachos. Fritada has been a mainstay of Ecuadorian parties and family gatherings since the beginnings of the 1800s. Guatita is considered a national dish and dates back to the 1500s. Essentially, the recipe includes cow intestines that are boiled and then refried with onions and spices. Normally, it is served with potatoes and a peanut sauce. Guatita is a dish for the brave cultural foodie- if you you can get over the texture, it has a great flavor! Humitas are a simple, yet delicious meal that students always rave about. Essentially, they are just tamales made of corn meal that are stuffed with cheese. However, something about how they make them in Ecuador makes them stand out. Ask an Ecuadorian and they will say it is because they are made with corazon y alma (heart and soul). Humitas are cheap and go great with coffee. There is a very popular Humita restaurant a couple minutes walk from Vida Verde. Travel in the highlands of Inca country, and you’re likely to be offered cuy, a traditional Andean entree. Cuy are guinea pigs and are considered pets in many countries; therefore it is quite strange for many foreigners to eat them. However, it is a staple of the Andean diet because they breed rapidly and have a taste comparable to rabbit. In Ecuador, cuy is often cooked over an open flame and served with boiled potatoes. Ecuadorian seco de chivo is a goat stew dish braised in a sauce of garlic, cumin, peppers, onions, cilantro, tomatoes and various other spices. Seco de chivo is normally served on special occasions. Traditionally, seco de chivo was accompanied by chicha, a fermented corn beverage favored by the tribes in the jungle. Nowadays beer is more common. Restaurants serve the same dish with every other meat imaginable. Most huecos (small, hole in the wall restaurants) will have seco de something on any given day. Interestingly enough, the word seco translates to “dry,” but the dish is quite the opposite! Canelazo is a traditional spiced hot drink from the highlands in Ecuador. The original canelazo recipe is made by boiling water, naranjilla juice (a cousin to oranges), cinnamon and panela sugar. Then it is mixed with a local sugar cane alcohol called puntas or aguardiente (translated burning water). It is mainly enjoyed during the cold nights in the mountain region of Quito. A few sips of this potent stuff is sure to warm you up! Colada morada is a thick and hot traditional Ecuadorian drink made with fruits, spices, and purple corn flour. It is prepared for the Dia de los Difuntos, a festival to honor and remember loved ones who have passed away. 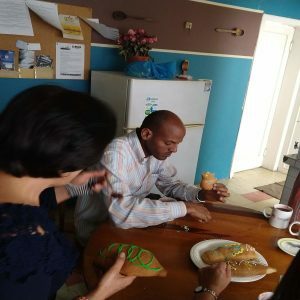 As with most Latin American holidays and events, there is always a food aspect to any special day, in this case one of those food components is a thick purple drink called colada morada. It is typically served with sweet breads shaped in the form of dolls called guaguas de pan. Have you visited Ecuador? Feel like we’ve missed a dish out? We’d love to hear your favorites. Post them in the comments below.